This one was an odd one to review. I have been a comic fan for many years and even ran a comic shop for four years. I was anticipating this title for some time and hoping for the best. On first viewing, I was left feeling somewhat deflated, although I had thoroughly enjoyed the movie. It took some thought, and finally I worked out why the movie didn't kick me in the guts to the extent that it should have... It quite simply tries too hard to give too much to the audience and the comic creators who worked on Daredevil the comic. I'll give you the lowdown on this one without really destroying the movie for you. Matt Murdock (Ben Affleck) is Daredevil, a vigilante who lost his sight at an early age when radioactive fluid spilled over him. Naturally in comic world, when radioactive fluid spills on you, instead of making you really sick and dying, you gain super-powers. In this particular case Matt's remaining senses are heightened to such a degree that sound acts like a sonar for him, allowing him to "see" objects based on the resonance they make. When something such as rain happens, the altered sense he has been given is heightened even further. With advanced hearing like this he takes refuge in an isolation tank in order to sleep. After his father is killed for refusing to take a fall during a boxing match, the young Murdock vows to protect the innocent and becomes a successful lawyer by day and the vigilante Daredevil by night. His domain is Hell's Kitchen in New York and none dare to risk his wrath. None other than the notorious Kingpin of crime Wilson Fisk and his hired assassin Bullseye. Now I'll stop as otherwise I'll rip what little is left of the storyline away from you. As far as video transfers go, this one is a crisp and clear treat for every television out there waiting to play this movie. You can see every in the movie and all the shadows are displayed crystal clear so movement within shadows can be easily defined as well. There is a problem however with this degree of detail and that is that we can see all the faults in the movie's computer generated images (CGI). There are a couple of cringe worthy moments when the mistakes are glaringly obvious and character movement quite simply look unnatural. Audio is magnificent as well, truly making the disc shine as an interactive experience for those of you lucky enough to have a surround set up, (and believe it or not you can get one for under $500 nowadays that will do the trick) as this will certainly change the way you watch and hear your movies! A Dolby Digital 5.1 and DTS 5.1 soundtrack option will have your own senses tickling as the movie explodes to life in your loungeroom. The amount of extras on these DVDs will absolutely floor you and the nice thing is that they are all very enjoyable as well. For the most part, the stuff that is on disc one does reiterate itself on occasion, however it's good that so many different ways of viewing the movie were even offered, and each of them provides a real insight into how the film was created. The second disc is where the disc is most full of meat and is divided into two sections, the movie and the comic book. By selecting one or the other, you get a variety of options to choose from that should ensure many hours of entertaining and informative viewing. This is where the disc becomes a lot of fun for everyone as it is so packed full of detail that both movie buffs and comic fans should both be more than satisfied with what is on offer. 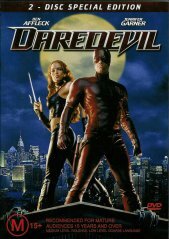 Despite it's flaws, (and it does have a few) Daredevil is a well packaged 2 disc set that will provide many many hours of pleasurable viewing. Don't expect too much of the storyline and you will most certainly enjoy it all the more.